December 8, 2018 from 5:00 – 9:00 p.m. Follow this link to learn more. There are two vacancies on the Town of Garden City Board of Trustees. To be appointed to a trustee position, you must be a resident of the Town of Garden City for at least the last twelve consecutive months, must be at least eighteen years of age and be a registered voter. The position of Trustee is part-time, and this is reflected in the compensation paid to those elected. Board members are expected to attend two regular meetings, usually on the first and third Tuesday of each month at 7:00 P.M. In addition, there are occasional special meetings, which are normally of short duration. If you are interested in being appointed as a Trustee, please send or bring a letter of interest to the Town Hall on or before August 15, 2018. If you are interested or have questions, please call Cheryl Campbell at the Town Hall: 970-351-0041. After years in the planning stages, Garden City’s dream of a friendlier landscape is becoming a reality. On May 29, 2018, Naranjo Civil Constructors will start work on the 8th Avenue Realignment Project. Garden City is shifting their portion of 8th Avenue to the west to allow for safer and more convenient parking, sidewalks, signaled crosswalks, trees, pedestrian lighting and more. Businesses will be open and accessible to customers during construction, which is expected to be complete in mid-November. In the first phase, which will last approximately six weeks, 26th Street will be closed at the Everyday Store on 8th Avenue. Please keep that in mind when planning your travel in the area. If you have any questions, please call the Town Hall at 970-351-0041. If you’d like to come by the Town Hall, the address is 621 27th Street Rd. After five years of service to the community, the Garden City Outreach Center is now closed. We appreciate Lonelle Archuleta’s hard work to help those struggling to make ends meet. She is a blessing to many families and individuals in the community. Fil Archuleta was sworn in as the new Mayor of Garden City at the Board Meeting on April 3, 2018. Mayor Archuleta has served on the Board of Trustees since 2008. Trustees sworn in are Terry Greenwood, Tara Murlowski and Willie Spaedt. There is a vacancy on the Town of Garden City Board of Trustees. To be appointed to a trustee position, you must be a resident of the Town of Garden City for at least the last twelve consecutive months, must be at least eighteen years of age and be a registered voter. The position of Trustee is part-time, and this is reflected in the compensation paid to those elected. If you are interested in being appointed as a Trustee, please send or bring a letter of interest to the Town Hall on or before May 1, 2018. It is suggested, but not required, to attend the May 1, 2018 Board Meeting at 7:00 p.m. to present your letter to the Board. On February 25, 2018, Americanism Day was celebrated at VFW Pioneer Post 2121 in Garden City. Local First Responders and Junior ROTC were recognized by the VFW for outstanding service in their fields. 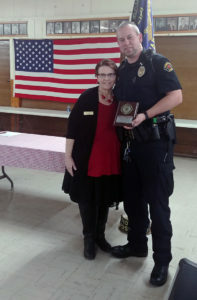 Garden City Police Chief Jeremy Black was presented with an award for Police Officer of the Year by Garden City Town Administrator Cheryl Campbell for his tireless efforts in establishing the Garden City Police Department.